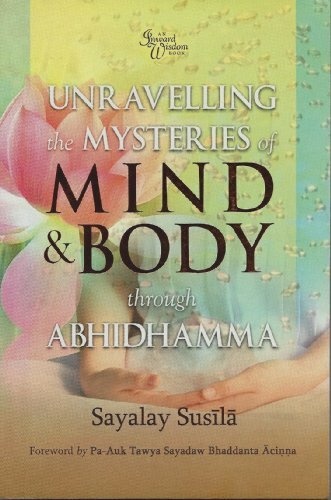 The study of Abhidhamma helps us to gain an understanding of how the mind works, which is essential for us to lead a happy and blameless life. Abhidhamma is a combination of two words: Abhi and Dhamma. Abhi means higher, special, or sublime. Dhamma means universal truth or teaching. Hence, Abhidhamma is the higher teaching of the Buddha, grounded in truth and experiential reality. It is not metaphysical theory, as some portray it, but rather a systematic classification and explanation of all physical and mental phenomena for earnest meditators to directly know and see. In Abhidhamma, the ultimate realities of mind and matter, which make up this so-called being, are seen to be an impersonal stream of consciousness-moments and infinitesimal particles that continuously arise and pass away, dependent on causes and conditions. Thus, the study of Abhidhamma helps to shed the painful illusion of an 'I,' or permanent self. To aid the study of Abhidhamma, this book follows the axiomatic approach of Abhidhamma but also tries to put concepts, such as bhavanga, the five-door cognitive process, and the jhana cognitive process, into practical contexts. To aid practice, two serenity meditations (Mindfulness of Breathing and the Four Elements meditation), as well as a moment-to-moment insight meditation, are presented.